There are many ways people can deal with challenges in their lives. There are many ways people can deal with challenges in their lives. They can ignore the realities, or they can break through the bars of their new environment. We found people from one local program who are not rolling over in bed. They're rolling on with their lives and finding themselves again. "We just want this to be like an oasis that they can come to and be part of,” said Robb Schulze, the CEO of the North Olmsted Golf Club . That’s where a special program called The Turn happens. Between the tees, there's little talk of birdies, bogeys and ball flight. But there is beauty. 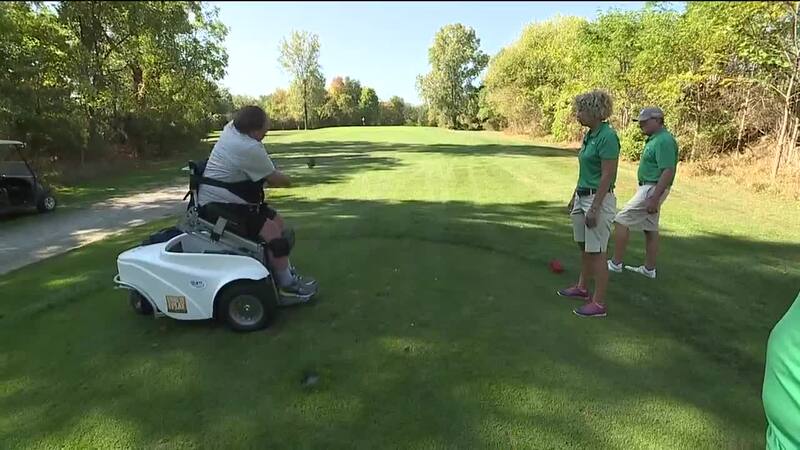 It’s not always in the form of the golfers, but it’s in the effort of those who are disabled. "They want everything they can get out of life,” said Trevor Hazen, the director of The Turn. Herb Werner from Bay Village participates in the program. He told us The Turn got him going again after he was paralyzed. “Initially, there's nothing more you want to do than to roll over and go back to sleep and wake up and find out, ‘Oh, this is a dream.’"
However, The Turn uses a handful of paramobile carts and other mobile tools to lift, adjust and move bodies around the course. There’s also physical therapy all year round in the basement of the clubhouse. That’s where we found Collin Smith, a Marine. "I was the turret gunner, the first car,” said Smith. He was in Iraq where, in an instant, a sniper shot Smith nearly ended his life. "I was turning around…and then…bam! I don't remember anything,” Smith said. "He was not just shot,” said Smith’s mother, Melissa Smith. “I mean…part of his brain is no longer there." But his whole heart is there, and he's now sharing it on the course. “To see how far Collin has come in his time with The Turn continues to motivate me on a day-to-day basis," said Hazen. You see, The Turn is much more than machines. “This is re-engaging in life,” said Werner. “There's no other way to put it. To be able to do things that you did before." It is an oasis, a place of acceptance, a place of encouragement and a place of togetherness. It’s all proof that The Turn isn't just moving bodies but moving the spirit just as well. The Turn operates on the generosity of others. It’s a non-profit group that runs 42 weeks out of the year. Click here for more information about The Turn, including how disabled people can join and how you can volunteer.